High wind zones requires more uplift protection than indicated above. Treated uplift cleats are replaced with #4 rebar and a concrete collar 4-6″ above the rebar is used to combat 120 mph and higher winds. 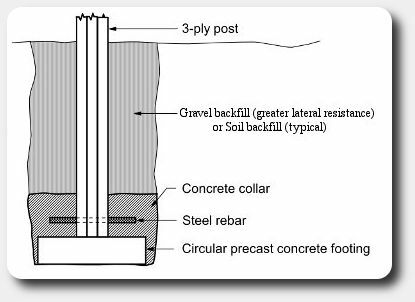 Larger buildings and taller walls in Exposure C classifications may require filling the hole with concrete and embedment deeper than 4′. For 90 mph 3 second wind gust and below, the rebar is replaced with (2) 12″ 2×6 treated uplift cleats, the concrete collar is not required, and the backfill is simply well compacted dirt. Corner bracing was not included in the infographic above but they are a good idea for walls 12′ and higher. We provide corner braces in all building packages but they aren’t really necessary for 8′ – 10′ walls in low wind areas. Corner braces are nailed at each post, and at each brace to girt location. 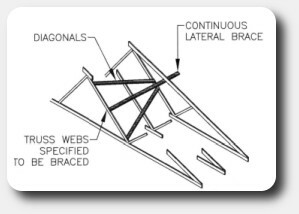 Many truss drawings specify continuous web bracing as part of construction to support the truss design they provide. 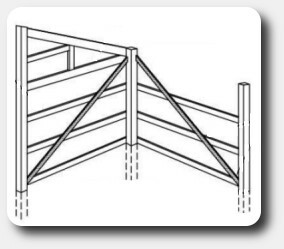 Sway bracing is important for structures with large openings, long lengths, and for areas with high winds. Sway bracing, purlins, lateral bracing, and web bracing should be of similar material, typically #2 2×4 dimensional lumber.